Twitter continues to gain popularity as a source of up-to-date news and information. As a result, numerous event detection techniques have been proposed to cope with the steadily increasing rate and volume of social media data streams. Although most of these works conduct some evaluation of the proposed technique, comparing their effectiveness is a challenging task. In this paper, we examine the challenges to reproducing evaluation results for event detection techniques. We apply several event detection techniques and vary four parameters, namely time window (15 vs. 30 vs. 60 mins), stopwords (include vs. exclude), retweets (include vs. exclude), and the number of terms that define an event (1...5 terms). Our experiments use real-world Twitter streaming data and show that varying these parameters alone significantly influences the outcomes of the event detection techniques, sometimes in unforeseen ways. We conclude that even minor variations in event detection techniques may lead to major difficulties in reproducing experiments. The research presented in this paper is funded in part by the Deutsche Forschungsgemeinschaft (DFG), Grant No. 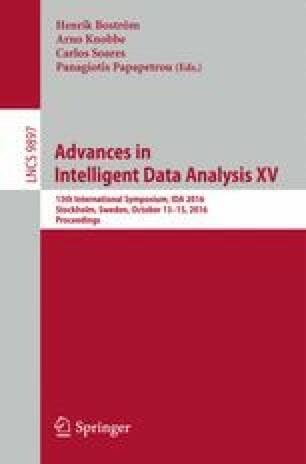 GR 4497/4: “Adaptive and Scalable Event Detection Techniques for Twitter Data Streams” and by a fellowship within the FITweltweit programme of the German Academic Exchange Service (DAAD). We would also like to thank the students Christina Papavasileiou, Harry Schilling, and Wai-Lok Cheung for their contributions to the implementations of WATIS, EDCoW, and enBlogue.